One of the biggest complaints the AA readers had about Monday’s Home Run Derby was the lack of competent announcing. I’m sure that will also be a common complaint during tonight’s game called by Joe Buck, Harold Reynolds, and Tom Verducci. But let’s go back to happier times in Minnesota. 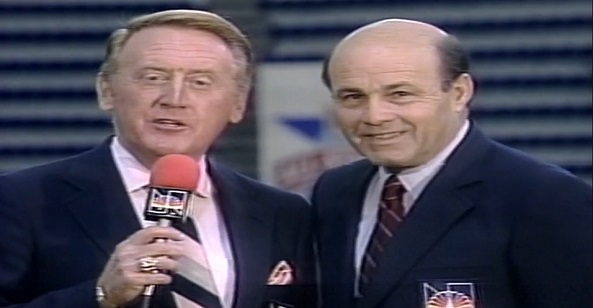 Here’s the opening of the 1985 All-Star Game at the Metrodome, as narrated by the one and only Vin Scully. It’s a fantastic reminder of what a great intro to a game can sound like, and another great reminder of how little Scully has changed over the last 30 years. Enjoy. For the record, the National League won the game 6-1, and the MVP was LaMarr Hoyt, who Scully mentioned in his intro.